While the Google Experience Launcher found on the Nexus 5 is great, and adds quick access to Google Now among other nice features, it isn’t very customizable. Grid size options are non existent, adding and removing additional homescreen pages is a pain, so at times it can be a big downer. 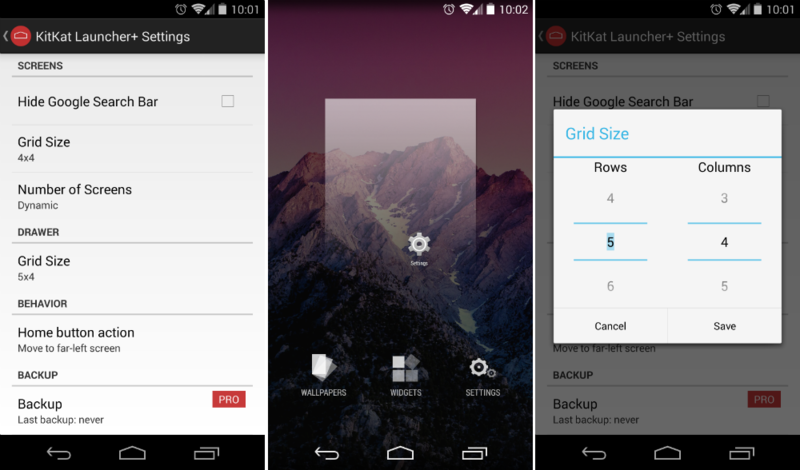 A developer has released a new version of the launcher called KitKat Launcher+. With this launcher, users can tweak the grid size, add and remove pages without having to place widgets or icons on the page, plus you can hide the Google Search bar. It’s definitely worth a look if you need more options for your launcher. The app is free to download and use, but if you buy the Pro version, you can will see a backup and restore option added to the Settings menu within the app. If you find yourself constantly changing up your homescreens, this is a handy feature to have. Make note, if you do plan on using this launcher, you won’t see Google Now integration any longer, and unfortunately, there is no custom icon support as of this moment. Maybe that will come with time. What launcher are you using these days? Stock? Nova? Let us know down below.